Book Review: 'Wolf In White Van,' By John Darnielle | Musician John Darnielle of the Mountain Goats tries his hand at fiction in Wolf in White Van, the story of a disfigured genius who creates an immersive roleplaying game set in an imagined world. 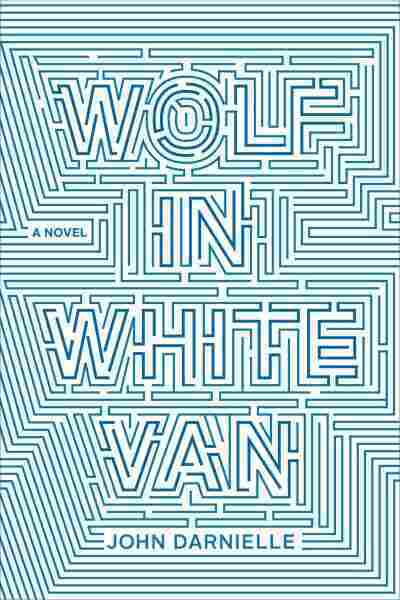 In the opening chapter of Wolf in White Van, the debut novel from singer-songwriter John Darnielle, protagonist Sean Phillips descends into a memory, and imagines other paths within it. "There are several possibilities," he tells us of a hallway in his family's home, with its many doors and secrets. "They open onto their own clusters of new ones, and there's an end somewhere, I'm sure, but I'll never see it." It's both a pitch-perfect description of the past — an endless maze of untapped choices — and a subtle articulation of one of Wolf's central themes: the way a role-playing game can parallel a person's real life. After all, what is life but a scrupulously detailed, real-time Choose-Your-Own-Adventure story with actual death at the end of its infinite plotlines, most of which you will never see? Disfigured by a terrible accident — or it might be more accurate to say incident — in his teens, Sean lives as a recluse and manages a text-based roleplaying game, Trace Italian, through the mail. In the game, players make their way across an irradiated, post-apocalyptic Middle America. They are searching for the sanctuary of the Trace Italian, a fortress in the Kansas desert, though no one has ever made it that far. Just before the book opens, a pair of teenagers acts out the game's steps in real life, ending in a tragedy for which Sean is taken to court. Wolf is no Law & Order-style drama — we learn early on that he is not held responsible for their actions — but from there, the narrative moves backwards, spiraling in reverse through Sean's life and bringing the reader to the cusp of the moment when everything changed. The whole world is a story to young Sean: from patterns in dried ceiling paint to rocks in filled-in ponds to the assorted medications prescribed to him in the hospital. His voice is steeped in video games, bad sci-fi movies, and Conan the Barbarian comic books, all touchstones of a childhood awash in creative play. Sean immerses himself in his wild imagination, even when it curdles and overwhelms. After a move and difficulty making friends, he says — with characteristic understatement — "I had grown receptive to dark dreams," as he imagines himself a brutal king overseeing a ruined dominion, backed by a soundtrack of screams. Every move I send out begins with the same word: You. When I first wrote most of them ... I had in mind only a single player, and of course he looked almost exactly like me: not me as I am now, but as I was before the accident. Young and fresh and frightened, and in need of refuge from the world. I was building myself a home on an imaginary planet. I hadn't considered, then, how big the world was; how many people lived there, how different their lives were from mine. The infinite number of planets spinning in space. Wolf's structure, in which plot dances around an unspeakable memory that must be teased out of the text, is not new — but Darnielle is a master at building tenderness from this unspecified grief. Wolf is about the way storytelling can deliver you, though not always save you, from the blistering, profound pain of adolescence – or just existence. "It's hard to overstate how deep the need can get for things to make sense," Sean says, and he is right. The mystery of life, as with the novel, isn't just learning what happens next; it's understanding what's come before. John Darnielle is a great songwriter, tipping light toward every kind of human suffering, and his powers are on full display in Wolf in White Van. The prose lives like Sean's imagination: a breathing, growing thing. In Darnielle's novel, as in his songs, the monstrously true and unbelievably beautiful press up against one another. Together, they begin to dance.